Herculaneum lies few miles north of Pompeii and was the exclusive holiday resort of the wealthy Imperial Rome. It was partly excavated from a dense and compact slab of mud and ashes, caused by the eruption of Vesuvius. The excavated area is less crowded and much smaller then Pompeii but with some unique discoveries such as the perfectly preserved thermal bath with the evidence of the heating system and the original wooden structural details of the buildings, which didn’t survive at any other ancient site. 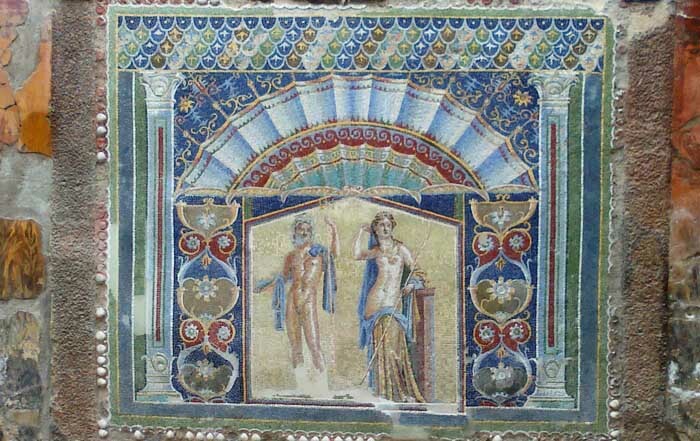 Here frescoes and mosaics are perfectly preserved. The tour in Herculaneum takes about 2 hours.